Make Your Own Memory Dinner At Home It's easy enough to make a meal delicious, but how do you make it memorable? A supper club called Sensorium set out to do just that, using a little memory science to engage all the senses in the service of the palate. Dinner with a side of memory: A supper club extravaganza staged in Washington, D.C., this spring enlisted all the senses — and some actors and musicians, too — to enhance diners' experience and memory of the food. Think about the last great dinner party you went to. What was the most unforgettable detail? The conversation? The service? If you can't quite remember what you ate, you're not alone. While we often remember having a good time, we tend to remember very little about the food, or more specifically, what it tasted like. That's something that frustrates Washington, D.C., chef and entrepreneur Bryon Brown. He still recalls a great meal with his beloved Aunt Michelle, even though it happened 10 years ago. Brown grew up in East Harlem in the 1980s; his family didn't have a lot of money, but Aunt Michelle was always there, encouraging him. When he got his first paycheck, he took her out for her birthday to a fancy Italian restaurant in Manhattan. He remembers how the waiters glazed the wineglasses, how well they treated his aunt, and what she was wearing. "She was in ... her Sunday's best, she had on a big hat, Sunday's, and she's really old school," he says, cracking a broad grin. It was a big deal for both of them, but something still bothers him about it: He can't remember the food. He believes he can change that for other people. "Food is a conduit to joy, and if you see it that way, you could use it to your advantage and create these very memorable moments," Brown says. But how, exactly, to do that, he wasn't sure. Fast forward a decade to this spring. Bryon Brown launches a project called Sensorium. "It's a feast for the senses," says Brown. He hired actors and musicians to harness the senses and enhance diners' experience of the food — his food. Sensorium is a unique, 12-course dinner party that's part circus, part play. It was held in a three-story high geodesic dome in a field near Washington's Anacostia River this spring. When we first heard about Brown's project, we knew he had to meet Ed Cooke. 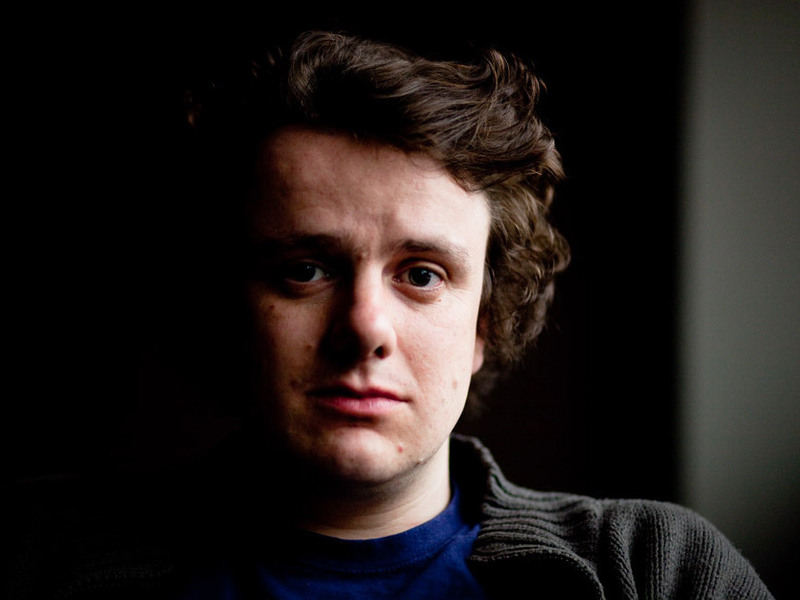 Ed Cooke is an international memory champion and founder of Memrise, a website designed to make learning languages fun. He's the kind of guy who memorizes 16 decks of cards in an hour for fame and glory, and enjoys reciting Paradise Lost to strangers in a park for fun. He's also the guy who taught author Joshua Foer to become a memory champion in his new book, Moonwalking With Einstein. Ed Cooke is an international memory champion. Cooke says taste is the trickiest sense to pin down because it's fleeting and hard to describe. Cooke became interested in memory back when he was 18, back in England. He was laid up in the hospital for about three months and surrounded by octogenarians, and he thought to himself: I've got to keep my memory going. He studied the interplay of the senses under neuroscientist Charles Spense at Oxford University. We knew he'd be game to advise Brown on the memory science part of Sensorium. But first — why is remembering the taste of food so hard? Cooke says taste is the trickiest of all the senses to pin down because it is fleeting and hard to describe. "You can remember basic attributes of the taste like sweet or sour, crunch and so on, but to actually reproduce it in your memory is a very elusive thing," says Cooke. We also have a poor vocabulary to describe taste, and have to rely a lot on metaphors to describe it — the pudding was a cloud of chocolate, and so on. Cooke says taste also relies on other senses — sight, smell, texture and even sound — to help it out. But those other senses can hinder taste, too. For example, being on a noisy airplane makes food tastebland. I ask Cooke why we would want to remember anything when we can just look it up on Google. Cooke says a lot of people have this attitude. They think memory is boring. It's for drills and shopping lists. "But there's another way of thinking about memory as sort of a rich, colorful, imaginative emotional playground for your soul. And that's the way you have to think about it to be able to remember effectively," he says. And taste especially "has enormous opportunities for playing around and being experimental," he says. And that's what Bryon Brown's Sensorium is all about. How to stage your own memory dinner party: Memory expert Ed Cooke lays out the three basic rules. If you want to try this at home, tell us how it went — write us at memorydinner@npr.org. To make a lasting memory, whether its food or anything else, Cooke has three basic tips. First, make it vivid. "You know, if your PIN number is 4197 or something, if you just imagine it as a couple — a 41-year-old married to a 97-year-old — immediately, even if it becomes slightly creepy, it also becomes memorable and in fact, for just that reason," Cooke says. Much of the Sensorium show was vivid, Cooke says. For example, during the fish course, actors holding fish puppets swum around the room while the dome pulsed gently with soft lights and music. It made the diners feel as if they were swimming with the fish underwater. Next, Cooke suggests making each course distinct from the others "because if there isn't a break, two things will kind of merge together in your memory," he says. Another course involved miniature bites of salty pork belly and sweet potatoes presented on dollhouse-sized chairs and tables instead of plates. Definitely distinct, says Cooke. And third: Include a narrative or a story or a piece of music that ties all the courses together. "A brain loves a narrative, and by having a narrative, you can kind of collect everything together under one roof in some sense," Cooke says. This is where Brown and Cooke disagreed. Brown and the actors feared that squeezing their project into a story would sound a bit cliche. "The challenge is, how do we incorporate some of these memory techniques and still have the artistry intact?" Brown said, just before opening night. Brown wasn't always a chef, but he always had a plan to get there. He worked hard, fell in love with the chemistry of cooking and molecular gastronomy, and dreamed of running his own kitchen. Bryon Brown's Sensorium is a unique, 12-course dinner party that's part circus, part play. 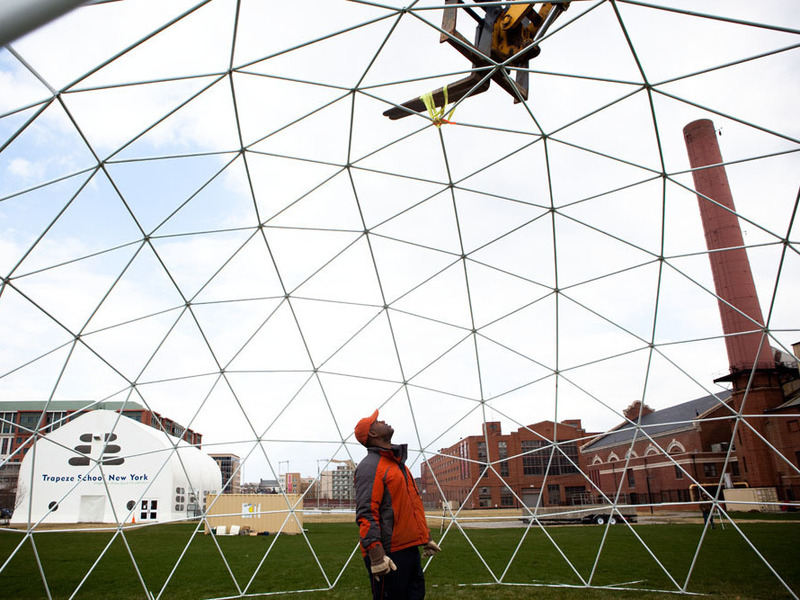 It was held in a three-story high geodesic dome, shown here under construction, in Washington, D.C. this spring. But without the money to open a restaurant, he didn't have a lot of options. Then he came up with the idea of creating one-night supper clubs for paying guests; he called it Artisa Kitchen. He partnered with local art galleries, where he met many of the actors he later hired for Sensorium. David London, a magician, worked at one of those galleries. He and Brown immediately clicked. "His approach to food is very similar to what magic and illusion is," London says. Both Brown and London use science and logic to make their art look effortless. London later became Sensorium's master of ceremonies, leading diners through several courses of the meal and coordinating with the other actors. Just before the first show, Brown had a few extra challenges to deal with. The lights and the sound system couldn't be installed properly because the dome was leaking. And there was a strange echo that his crew had to address using sound-absorbing foam. But opening night waits for no man or dome, so Sensorium opened April 9. Diners waited anxiously in the entryway, sipping a spicy sangria and meeting the actors. It was something out of Alice in Wonderland a little bit. It was really kind of bizarre, but in a fabulous way. Once they were let into the dome, diners were seated at several round tables surrounding a tiny stage. "Welcome to Sensorium," the master ceremonies intoned, and diners were led through a parade of dishes, including a salmon salad on a bed of dry ice, sunchoke soup, and a dessert of chocolate soufflé sprinkled with salt. Cooke praised the show as well, calling it "truly close to being spectacular," but he says he wished there was a narrative. As for the diners? Many remembered several courses, but none I talked to could remember all 12. "They began with a pearl they call that caviar... the order I can't quite remember, but then we had a soup course," said Arturo Brillembourg, a diner who is the treasurer of the Washington Ballet. "The taste of the Pop Rocks stayed with me all evening long," said Carl Ballard, a diner and broadcast producer at AARP. "It was something out of Alice in Wonderland a little bit. It was really kind of bizarre, but in a fabulous way," said Lauren Green, who also works at AARP. Brown's pretty happy with how Sensorium went. He put on almost 50 dinner shows in the month it ran. But he's not resting. He will be holding various workshops around D.C. this summer to brainstorm ideas for the next iteration of Sensorium. He hopes to open a Miami version this fall, and he's already talking to investors in New York City. "I want to make people notice that Sensorium and Artisa Kitchen are a force to be reckoned with," he says. Next time? "We're definitely going to use a lot more of what Ed has taught us," Brown says. This story was produced for broadcast by Rebecca Davis.